Looking for a handy recipe using that old turkey? 2. Fit 1 wonton wrapper into each of 24 mini muffin cups coated with cooking spray, pressing the wrappers carefully but firmly into sides of cups. Bake at 350º for 7 minutes or until lightly browned. Keep wontons in muffin cups. 3. Combine remaining ingredients in a medium-sized bowl. If it’s fairly juicy (depending on your salsa), it’s helpful to drain out some of the liquid before moving on. 4. Then add a pinch (about 1/2 Tbsp.) 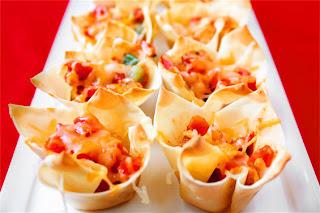 of cheese into each wonton cup, followed by about 1 Tbsp. of the turkey mixture. Then top each wonton with another pinch of cheese. Bake at 350º for 6 minutes or until cheese melts. Remove from muffin cups. Serve immediately. 5. Enjoy those turkey left overs!